Amidst all kinds of online marketing efforts, including SEO and other digital marketing, what always stands out as the sole factor impacting the success of your online store is your dedication to an immersive and enriched customer experience. Your market strategies and process efficiencies – everything comes after. If your customers do not have a good experience while they are on your website, then you won’t have sales. It is as simple and as complex as that. Which eCommerce platforms you choose is one of the first and foremost decisions that will drive your success. eCommerce solutions provided by the top eCommerce platforms power your business and make it scalable in the long run. By choosing one of these best online store platforms, you not only end up engaging your customers with your brand and make their buying journey a smooth one, but also impact your bottom line in terms of sales growth. 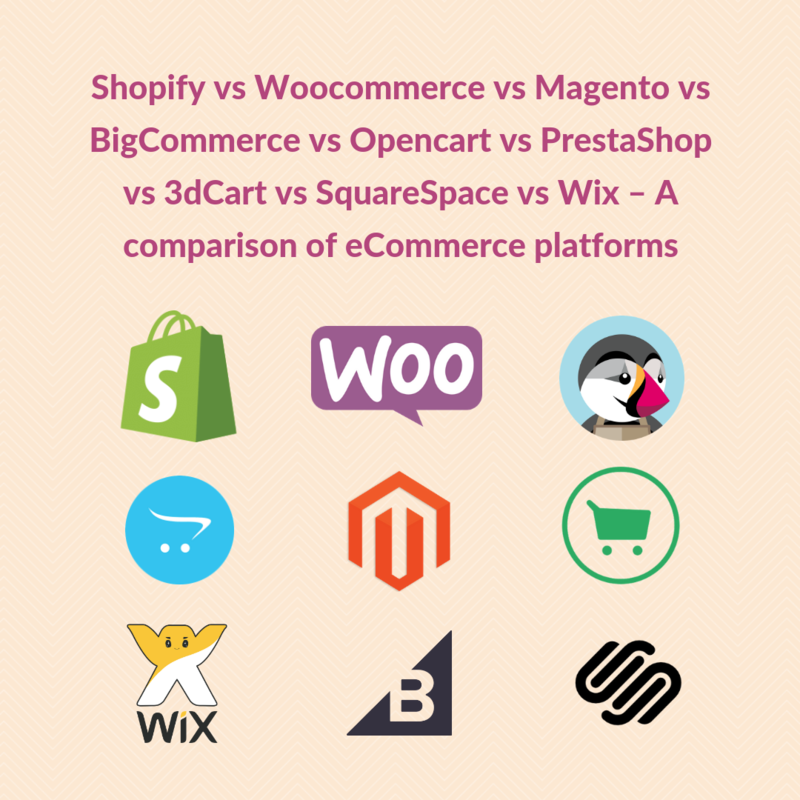 Thus, comparing Magento vs Shopify vs BigCommerce vs Opencart vs PrestaShop vs 3dCart vs SquareSpace vs Wix vs Woocommerce before deciding on which shopping cart solution to choose will be one of your most critical tasks as an online merchant. Apart from these, there are two more ways in which an ecommerce platform may offer a hosting environment for their customers. Self-Hosted: On your business premises. While in self hosted eCommerce platforms, online store owners choose their hosting and deal with the installations and updates to the software manually, Cloud hosted ecommerce platforms offer hosting for their customers via off-site solutions. Amazon Web Services (AWS) is a good example. New to eCommerce? 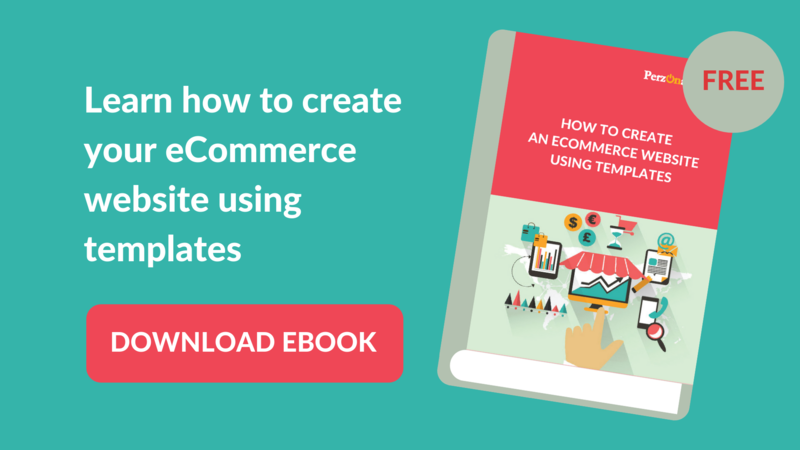 Download your guide and learn about what future has to bring for eCommerce. Updating a self-hosted ecommerce site can be quite costly and time-consuming, since the developers are required to maintain and update the website manually. The benefits of this kind of hosting however are, more control over your online retail platform, better understanding of data security and greater visibility of your data. Hosting environment, uptime and bandwidth, security etc. If you’re trying to choose an eCommerce platform, review each option’s features like its hosting environment, uptime, security, free themes, marketplace for apps, design and SEO. Tweet This! Let’s get you a comparison of the most popular eCommerce platforms. By far the most popular eCommerce platform by search volume, Shopify is considered among the most easy to install and set-up eCommerce platforms today. With the huge range of themes and plugins available for the Shopify online store platform, it can be set up with pretty much zero knowledge of coding. This eCommerce platform allows you to set up your online store and start selling immediately with the Shopify POS. The Shopify Burst allows you to get access to some incredible HD images for your online store. They also make it extremely easy for you to accept credit card payments with Shopify Payments. Full list of tools and features on their website. WooCommerce is now the most popular eCommerce platform with 11% of the Top 10,000 eCommerce websites using it. The platform is built on WordPress, which makes it one of the best eCommerce CMS you can find. It is free and gives you access to the largest possible range of plugins and themes available on any online platform. However, it requires a tad bit more technical knowledge to set up than some other platforms like Shopify. Additionally, you’ll need to find your own WooCommerce hosting and payment gateway alongside a website theme and custom plugins. Unlike other platforms, there is no dedicated customer service for WooCommerce. Seamlessly integrates commerce with content. Add the options you want. Cheapest option out of the box. Requires more technical knowledge to set-up than some other platforms. BigCommerce offers some very useful eCommerce solutions for entrepreneurs looking to build an online shop. BigCommerce is considered to be one of the best ecommerce platforms for small businesses, and their standard solution claims that they can increase sales, streamline your business and expand to new channels. For larger businesses, BigCommerce offers their Enterprise solutions, which has a higher level of reliability and some very advanced tools in the offering. They also offer bespoke solutions for B2B businesses. It’s a hosted eCommerce platform and includes integrated payments powered by PayPal alongside other providers. Their plans include unlimited products, bandwidth and file storage, and the pricing is based on the value of sales processed each year. Magento is undoubtedly one of the most powerful online store platforms, which however, comes at a cost. Their top selling plans cost substantially more than that of their competitor’s, but in exchange allows you almost total control over your online store. Magento has two options – The Magento Open Source and the Magento Commerce. While the former is their free, flexible, open source platform for developers and small businesses requiring specialised Magento web hosting; the latter is their cloud hosted solution and comes for a price. Both the options offer a full enterprise level eCommerce solution, but some users may find the set-up a bit of a challenge. Hundreds of extensions and themes. PrestaShop is an open source ecommerce software platform and is considered to be one of the popular eCommerce platforms with more than one million users. Like WooCommerce, PrestaShop also doesn’t require any cost to use the basic version of the software. However, you will need to do most of the set-up yourself. For starters, you’ll need to decide on the web hosting and acquire your own payment gateway. Premium add-ons are available for PrestaShop that is sure to extend the functionality of your eCommerce business – but most of these are not free. You will also have access to training modules and premium experts to help you build almost every aspect of your eCommerce business, but again, these are not free. WixStores comes from Wix – one of the leading free website builders. The WixStores is an exclusive offering for online store platforms. Hence, the platform is expectedly quite simple to get started with, and offers hundreds of templates to choose from. You can also get started immediately with their ad supported version, if you are a start-up working on a really low budget. You can change, customize and edit anything on your online store with the easy Drag-and-Drop functionality, and you can also create responsive websites with Wix. Great and a huge selection of themes to choose from. Can get started for free. SEO capabilities not that strong. Squarespace is a cloud hosted website builder, and like Wix, is one of the most popular options for building any type of website online. Their eCommerce platform allows you to set-up an online store quickly and rather easily. They do not have a free plan, although there is a free trial option. They also have relatively fewer payment options with just Stripe and PayPal for now. However, the features they offer are at par with most of the other popular eCommerce platforms. They claim that whether you are a start-up or an established brand, their powerful platform gives you everything you need to run your online store successfully. They offer a range of marketing tools – from search to social to help you engage with your customers, creating a powerful marketing strategy. Transaction fee of 3% on sales on their Business plan. 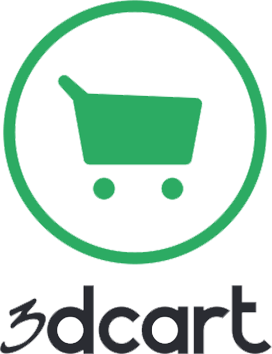 3dcart is an all-in-one eCommerce solution. The name was conceived from their perspective of the three dimensions of an eCommerce store – namely, Store Owners, Search Engines, and Shoppers. This online store platform offers a complete set of tools to help you build, market and sell from your eCommerce website. You can use additional apps to customise and for some extra features. Their shopping cart software is considered among the best shopping carts you will find among the platforms. They have other solutions like the B2B & Enterprise Ecommerce and simple Buy buttons. Their unlimited plans start at $29 a month and there are no transaction fees. They take pride in saying that they are a leader in advanced eCommerce features. 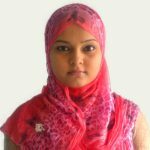 OpenCart is a free open-source platform and can be considered as the best eCommerce platform for small businesses. The platform is built on PHP any eCommerce merchant is bound to derive the benefits of the programming language. This eCommerce platform follows a core-extensions model; and you will need to install certain add-ons if you need a higher level of functionality. OpenCart has enormous range of extensions – almost 14,000 of them. The shopping cart software boasts of an impressive site speed – thanks to the AJAX technology. OpenCart is loaded with all the basic functions a user needs. The OpenCart multi-store function allows its users to manage and monitor multiple stores from a single Admin panel. In addition, OpenCart allows you to have shopping cart facilities, upload unlimited products, categorize them, etc. Plenty of templates on 3rd party resources like Themeforest, Template Monster etc. Features – 10 Easy to set-up, all-in-one eCommerce solution, no upfront cost and no risk. BigCommerce $29.95 per month $249.95 per month 30 days Yes, but can use own solution. Features – 10 Low upfront costs and a full range of features included with their standard account. One of the few platforms offering a solution specifically for B2B and whole businesses. The prices of some add-ons such as themes, apps and payments need to be considered. Features – 10 Fully featured, Enterprise level Ecommerce platform. It’s not the best if cost is a factor. Features – 8 It is good if you are technically sound and can troubleshoot problems. Great flexibility and customization at the lowest price possible. Features – 8 Cheap but powerful eCommerce platform. Additional support and many plugins are not free. Features – 10 Great tool for creating stunning websites. Insufficient payment options and 3rd party apps. Low customization. Features – 9 Huge range of extensions, ideal for small/medium businesses, guarantees impressive site speed, multi language and currency integrations. Hosting and Security costs to be borne by the user. When you ask yourself “which is the best eCommerce platform”, it can sometimes be really hard to tell how seemingly minor differences there are between the best eCommerce platforms in terms of eCommerce features and performance. It is really your needs that can help you decide which eCommerce solutions you need to choose. I will recommend that you have some frontrunners in your eCommerce platform list, and that is where I think this article will be helpful for you in terms of making the comparison of Magento vs Shopify vs BigCommerce vs Opencart vs PrestaShop vs 3dCart vs SquareSpace vs Wix vs Woocommerce. Let me know what you think.